I've somehow managed to find time to bind&glue down the fretboard for the koa-guitar. 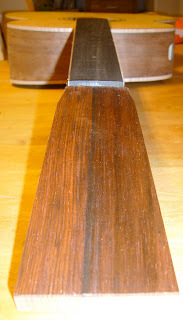 Still some radiusing to go before fretting and shaping of the neck. Anyway the stringing time seems to be approaching in schedule (delivery due hopefully in the beginning of December). The fingerboard is bound in flame maple, with b/w/b purfling. The body seems a bit asymmetrical in this picture. There's two reasons: First, the camera angle makes it look crooked. Second, it is asymmetrical. We'll call that art&design, OK? Aaaand... We have a guitar! Let the french polishing begin! Oh, there's another neck to do!